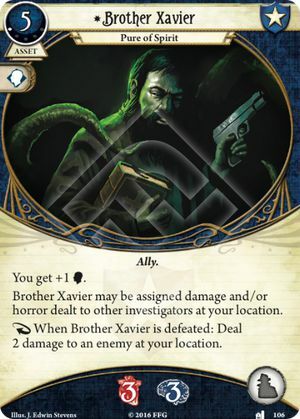 Brother Xavier may be assigned damage and/or horror dealt to other investigators at your location. [Reaction] When Brother Xavier is defeated: Deal 2 damage to an enemy at your location. Want to build a deck using this card? Check out the Arkham Horror: The Card Game Deck Builder! I had Brother Xavier in my Zoey deck, and my daughter referred to him as my "exploding boyfriend." He is good, but the +1 combat provided by the Beat Cop (and cheaper price) makes it a really tough call for Zoey. For Roland, Xavier provides much needed willpower though, that one's an easier call. For Skids it's tougher again, it shores up a weakness but the Manatee is so good! The Mississippi Manatee is slang for Leo de Luca, not sure where it originally comes from, but I assume it's to do with him being from Mississippi, not Louisiana. that is the strangest thing I've ever heard. lol.